Add cinnamon to dry mix and stir. 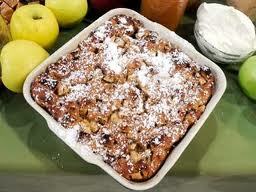 Add beer, apples and walnuts (optional). Mix (do not over mix) and pour into a greased 8×8 baking dish. Bake for 55-60 minutes. Remove from dish and brush with melted butter, including all sides and bottom. Let cool and drizzle with caramel ice cream topping. Top with nuts (optional).